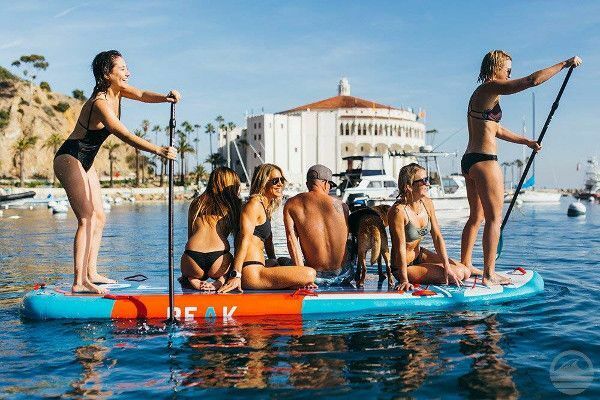 I don’t remember being this excited about an inflatable standup paddle board. 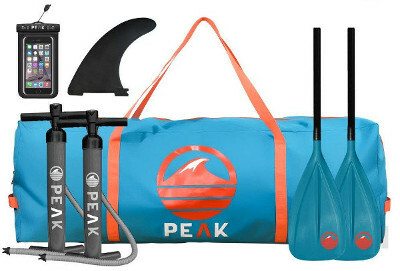 The Peak has done a great job with their iSUPs’ line making some of the greatest iSUPs out there. 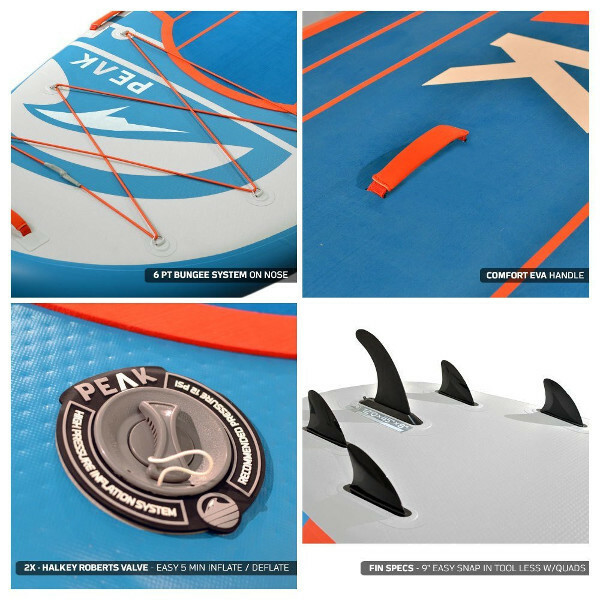 We’ve already reviewed some Peak’s boards on our website, which you can check if you are looking for a yoga or touring iSUP, or if you think that the Peak Titan is a little too big for you. That being stated; this review will bring you closer to the Peak Titan so as you can have a better idea about its aspects and features. To keep it as short as possible; this board is absolutely something different. It’s a family board par excellence, as it’s also great for friends who like to enjoy water activities together. It can also be used for yoga, fishing and touring; it can take multiple riders as it can perform multiple tasks. 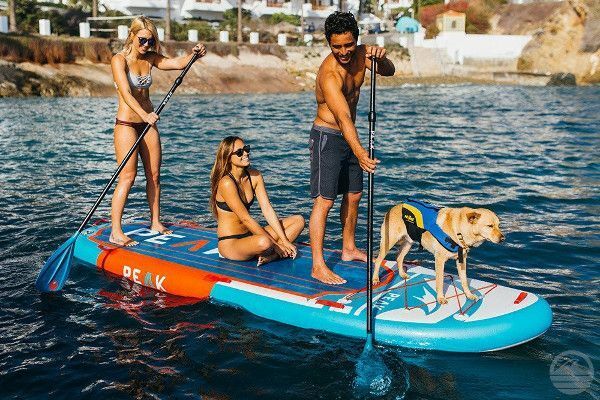 The name of this iSUP gives it all away; the Peak Titan is a huge iSUP that is designed for family trips or vacations with friends. This board is 12 feet long which can fit up to 4 people on board. If not people, then you secure as much cargo as you could ever need to the board for fishing or touring. What’s even better is that the Titan is 45 inches wide which is absolutely exceptional. This board is a moving water platform; it is super stable even when there are more than two riders on top of it. I have never reviewed or tried a board this large; it’s quite overwhelming. As for thickness; the Titan is 6 inches thick which is quite standard. I honestly wished it was thicker because being this large and wide would also need more thickness. However, these 6 inches work perfectly fine keeping the board on top of the water because the construction of the board as a whole is a really stiff and rigid one that reduces flexing down to nearly nonexistence. Such a big iSUP like the Peak Titan needs to be extremely well-built in order to maintain its shape and quality. 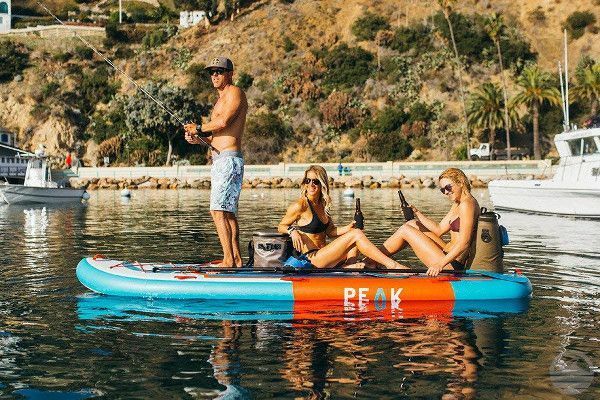 That being the case, the Peak made sure that all of their inflatable standup paddle boards are made of the most durable military grade PVC material that is known for making any inflatable product virtually indestructible. The Titan is also constructed using quality drop stitch technology to keep its parts glued together in a way that makes noticing their ends a little challenging. The details too are carefully made to make it look good but also feel rough. All in all, this is one hell of a strong iSUP that can carry up to 6 people without being exhausted or overused. Also, it’s absolutely able to take some serious beating before it’s time for it to announce defeat. However; please, always be a friendly user to enjoy the quality of your iSUP for as long as possible. The EVA traction pad; it covers more than half the board’s back and it’s really thick and soft. Also, the color choices for this board are really fun and visit. It’s easy to spot the board anywhere it was. You’ll find 9 carry handles located on all of the board’s rails for easy transportation when the board is inflated. These handles are rigid and comfortable to use. Next; there are two valves on the board’s tail, and it’s simple to guess why. Since the Titan is a huge board, it’s recommended that two people cooperate to inflate it or deflate it faster; thus, 2 valves will do the job a lot better and quicker. Furthermore; the Peak Titan is featured with a large storage area with 6 D-rings and a bungee cord on the deck. Anything can be stored there and taken out to the water in complete safety. A 6th D-ring is on the board’s tail for anyone who needs to attach a leash. And last but not least, this board comes with a navigation system which the least could be said about it is that’s awesome. The board has 5 fins attached to it; one is central, large and removable, while the remaining four are smaller and fixed. Usually, most board’s featured with only 3 fins max, the extra 2 fin here are quad fins and are meant to make it possible for the Titan to track in a straight line in flat water. The Titan is a monster when it comes to balance; nothing and no one can just easily cause to flip or wobble. 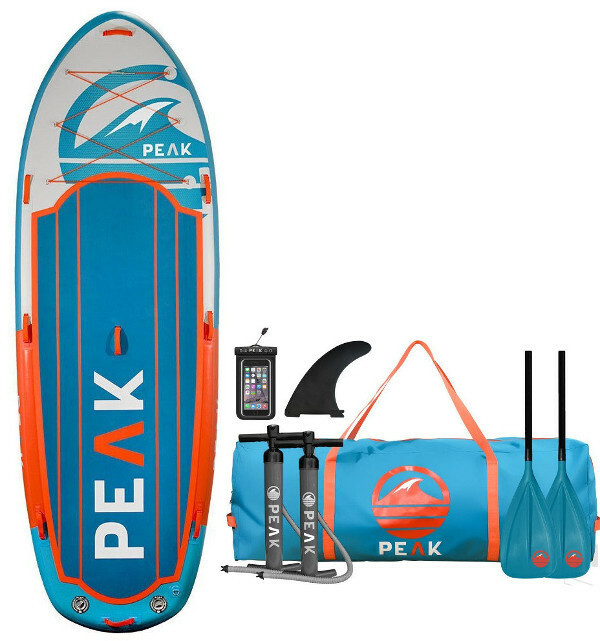 It’s an amazing board for yoga, fishing, and family trips. As for speed, one should really be rational here. This board is not meant to race or be super swift in the water. However; the Titan glides smoothly in flat water and tracks very nicely. Also, if two riders can sync their paddling movement, the board will be very responsive and versatile. The Titan’s package lacks only one thing; a repair kit. Apart from that, this is what you’ll be receiving once you ordered the board. Two floatable 3-piece adjustable alloy paddles with nylon blade. Two high pressure dual action pumps with gauge. And a waterproof phone case. It’s pretty much what anyone could need to handle any board. The Peak Titan is a tremendous iSUP that can take up to 500 lbs. It’s 12 feet long and 45 inches wide which is exceptional. It’s the perfect family iSUP/vacation with friends. It’s great for touring, yoga, and fishing or just chilling. It comes with 2 valves, 2 pumps, and 2 paddles. There is a strong and large bungee system on the deck. It’s super stable, rigid and durable. It’s featured with 5 fins. And 9 carry handles for easy transportation. You’ll get 30 days return guarantee and 1 year warranty from the company. The Peak Titan might be a little pricy for some of us, but only to be fair, the value and quality of this board explains it all. The package lacks a repair kit.